23 people attended Leicester Socialist Party's public meeting on 'Women's Lives Matter' on 16 March. Socialist Party member Heather Rawling spoke about the impact of austerity on women's services and the double oppression that working-class women face under capitalism. Steve Score, Leicester mayoral candidate for the Socialist Party, raised how we can fight back against cuts, and the importance of councils setting no-cuts budgets. Over a dozen people spoke in the discussion. A woman who works at a women's refuge gave extra context on how cuts affect services. The council is doing nothing to support them, so different services in Leicester have had to group together to campaign for the vital funds they need. Others explained the way Universal Credit is making it even harder for women to leave abusive partners and the even greater difficulty immigrants find accessing vital services. People in the meeting were definitely angry about the state of services. There was also a clear desire to fight to win back the vital funds for women's and other services that have been cut in Leicester. And to fight for the socialist transformation of our economy to ensure these services will always be available when needed in the future. Two women a week are killed by a current or ex-partner, according to Women's Aid. And on an average day 94 women and 90 children are turned away from refuges because there isn't room. 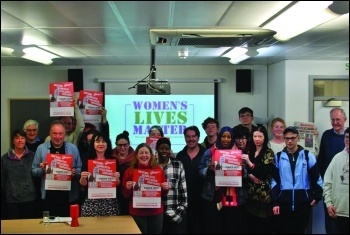 Leicester Socialist Party marked International Women's Day with a campaigning stall to defend domestic violence services. We handed out leaflets for our public meeting (see above) and had a petition calling on Labour shadow chancellor John McDonnell to pledge that an incoming Corbyn government will replenish any reserves used to avoid cutting these services. Women who had been victims of domestic violence and employees of women's services, who see first-hand the devastating effect of cuts, stopped to sign. One said: "I was in an abusive relationship for seven years. When I finally got help, I was told that me and my kids could go into a refuge but that we'd have to move away from Leicester. How is that fair? Why should we be the ones who have to move?" We say councils have a choice. They don't have to carry out vicious cuts to vital women's services, or in fact to any services at all. Needs-based, legal, no-cuts budgets can be set using reserves and borrowing powers, while fighting to win the funding back. This May, Leicester Socialist Party will be standing candidates in the local elections who will fight all cuts.